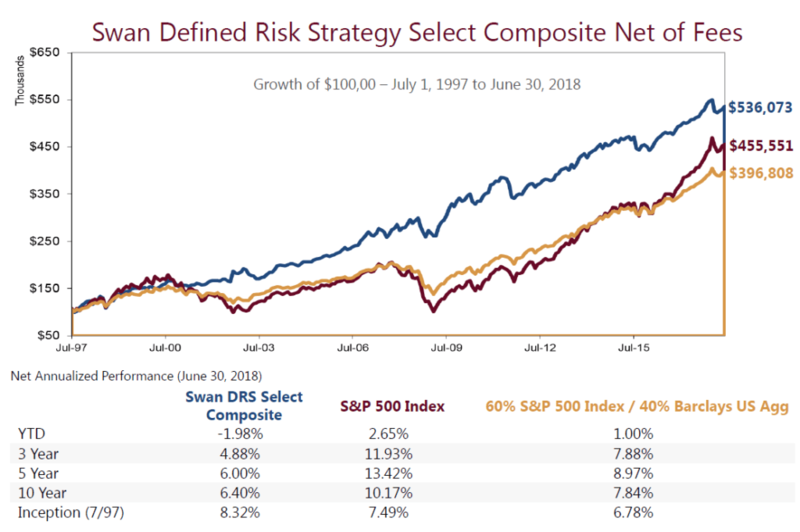 When Randy Swan first developed the Defined Risk Strategy (DRS) in 1997, it was designed to be a total portfolio solution. Randy started investing at an early age and tried many of the strategies available: buy-and-hold, market-timing, stock-picking, traditional diversification, etc. Those strategies did not prevent him from feeling the pain of the 1987 “Black Monday” crash or the 1990-1991 recession. It wasn’t until he started working with insurance companies while at KPMG that he struck upon the ideas that would one day become the DRS. A successful money manager might be in business for decades. Alternatively, successful insurance companies have been around for centuries. Ultimately, an insurance company bears the risk of policy claims, and its balance sheet must be strong enough to withstand those claims when they come in. A successful insurance company must invest their assets well, be very cognizant of the probabilities of unfavorable outcomes, and generate sufficient revenue in order to stay in business. Suffice to say, a hit of 30% or more to its balance sheet could be catastrophic. Exposure to the equity markets is maintained via low-cost ETFs, without any attempt to outsmart the market via stock selection or market timing. Downside risk is mitigated via the holdings in long-term put options. Revenue is generated from the premium collection trades. These three primary building blocks are complementary and seek to provide a source of returns in just about any market environment. After all, the market can do one of three things: it can go up, it can go down, or it can stay flat. The first component, equity, does well when markets go up. In the second component, the hedge gains value if the markets go down. With the third component, if the markets stay flat and range bound in a short time horizon, the premium collection trades tend to do well. It can be said with a high degree of certainty that in no environment will all three components positively contribute to performance. However, in any given environment, at least one, if not two, of the three components may contribute positively to the DRS. This, of course, is by design and is a manifestation of a truly diversified strategy. To dampen overall portfolio volatility, the individual components need to have a low or negative correlation. Historically speaking, the hedge component has been negatively correlated to both the equity position and the income trades, and the income trades have had a low correlation to the equity stake. Throughout a two-decade period that encompassed many peaks and valleys, the 100% Swan DRS Select Composite outperformed both the S&P 500 and a 60% equity/40% bond portfolio. Even though the current bull market is in its eighth year and is the second-longest bull market in U.S. history, the downside protection the DRS generated through the bear markets of 2000-02 and 2007-09 have compensated for its underperformance relative to the S&P 500 during the last several years. Source: Swan Global Investments and Morningstar; the Barclays U.S. Aggregate Bond Index and the S&P 500 Index are unmanaged indices, and cannot be invested into directly. Past performance is no guarantee of future results. Swan DRS results are from the Select Composite, net of fees, as of 6/30/2018. Structures mentioned may not be available within your Broker/Dealer. Only the most optimistic and foolish investors would argue that bear markets have been banished forever. When the next bear market does arrive, the DRS will be prepared. All that said, we realize that most investors are unable or unwilling to invest 100% of their money with the DRS. The DRS can still perform a constructive role within a portfolio either as a core equity solution, as a distribution vehicle, or as a capital preservation vehicle. Where Does Hedged Equity Fit? Analyzing the roles a hedged equity strategy, like the Swan Defined Risk Strategy, can serve in a portfolio to suit different objectives or investment mandates. Diversifying with the Defined Risk Strategy By now the arguments for and against picking stocks and indexing are well documented. At Swan Global Investments, our take on the whole passive-versus-active debate is a bit different. It doesn’t matter. Active or passive: it doesn’t matter. Dive into this engaging paper to learn why, and more importantly discover what may be overlooked in the broader passive vs. active debate. All Swan products utilize the Defined Risk Strategy (“DRS”), but may vary by asset class, regulatory offering type, etc. Accordingly, all Swan DRS product offerings will have different performance results due to offering differences and comparing results among the Swan products and composites may be of limited use. All data used herein; including the statistical information, verification and performance reports are available upon request.